Even on a stylist’s day off, she – that would be me – is still thinking about your hair! Welcome to my Mane-ly Monday, a time and space for collective observations and opinions on all things hair: the trends, techniques, treatments, tools, environment and more. As I reflect and recharge, I wanted to share a few of my favorite posts on the Karline’s Salon social network streams. I’ll call this list, No Harm – No Foul, for the articles that link to the posts range on topics from harmful hair product ingredients to how to tell others to keep their hands out of your perfectly coiffed style. Why this post makes the cut: The ingredients in hair care products matter. Sulfates and parabens can do more harm than good for healthy hair. Don’t be fooled by the claims of full lather, sweet smells and long-lasting. Always consult with your hair care professional or #AskKarlinesSalon for products that are right for your hair texture and type. Why this post makes the cut: We all know the benefits of milk for healthy bones, but it can also help with healthy hair growth. The article linked to this post provides a couple of ways to use milk in your hair maintenance routines. Why this post makes the cut: To be quite frank, duh, we wrote it. Subtle plugs aside, there are alternatives to relaxers and thermal reconditioning to tame your curls, control frizz and make your hair more manageable without using chemicals that change the structure of your hair or having to wait months to grow out the application. Why this post makes the cut: Heart disease is the leading cause of death in men and women, and more than 40 percent of African Americans have high blood pressure, a leading cause of heart disease and stroke. We encourage clients, staff and friends to learn more about heart disease. We can take good care of your hair but you must take good care of you. This hair is the work of blood, sweat, and tears, and a whole lot of money. Let’s not ruin it with your hands, okay? 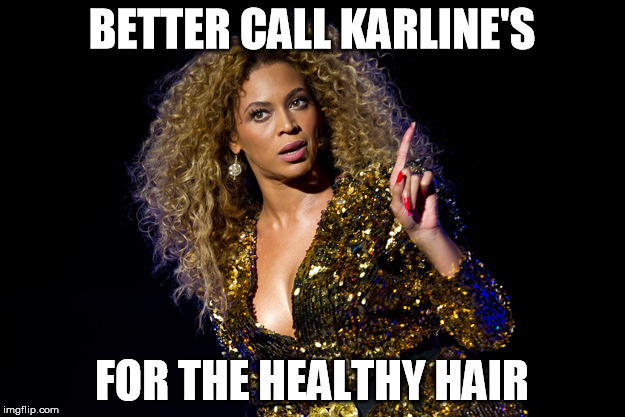 Follow Karline’s Salon on Twitter, Facebook and Google+ for article links or to share our favorite posts. I’m old school, in a sense, so when I started thinking about tips for an excellent hairstylist-client relationship, the Rob Base-DJ EZ Rock song, It Takes Two, came to mind (see the video at the end of this post). My standards and your expectations are more often in sync, but there are times when we could all use a reality check. I am going out on a “strand” to address them here. A woman’s relationship with her hairstylist can be like her relationship with a significant other: When things are going well, the woman is wildly happy, blissfully in love, and feels beautiful; but when things go wrong, life is a disaster, and she doesn’t know what to do. The bond between us should be like any successful relationship, wrapped in trust, honesty, communication and understanding. It’s not easy being in or behind the chair. Sometimes the relationship is complicated (you say “don’t cut,” we say “trim for healthy growth”), and a transformation takes time, patience, and a leap of faith. 1. To always be courteous and considerate on the phone and in person. 2. Acknowledgement and greeting the moment you walk into Karline’s Salon. 3. Respect for your time; to explain any delays in service and to offer to reschedule if you are unable to wait. 4. Discussion of your hair desires and an explanation of how to achieve them. 5. Healthy hair education; to explain the service and products for your hair type and condition. 6. An explanation of service pricing. 7. A relaxing environment, where the focus is on you. Our team members are instructed to excuse themselves and leave the floor for personal calls and breaks. 8. To practice what we preach and to present a professional appearance from head to toe. 9. To provide a clean and safe environment: equipment, tools and workstations. 10. To respect your opinion and to “make it right” if there’s the slightest bit of dissatisfaction. 11. Give the salon a courtesy call if you are unable to make your appointment. 12. Call the salon to reschedule your appointment If you will be more than 15 minutes late. 13. Be honest about hair services performed at home or by others; as well as over -the-counter products you’ve used on your hair. 14. Bring pictures of the haircuts and styles you admire and ask your stylist to explain what’s possible, realistic or steps to achieve the look. 15. Commit to a care regimen for healthy hair. Discuss with your stylist a maintenance schedule and what to do in between appointments. 16. Give the stylist and salon the opportunity to “make it right” if you are unhappy with your service. 17. Show your appreciation with a gratuity if you are pleased with your service. The traditional gift for a hairstylist is 10-20 percent of your bill. Use your discretion for others who may have assisted your stylist with prep, shampoo or blow drying. Remember you are not obligated to tip if service is below your expectation, but at the very least, discuss your concerns with the salon manager or owner. 18. Refrain from using electronics while a stylist or assistant works on your hair and scalp. 19. Only bring children who have an appointment for service. Because of the chemicals and tools we use, the salon is not an environment for children. 20. If you have any health conditions, allergies, or are taking medications, let your stylist know so that he/she only uses products and delivers services that will not interfere with your medical care. I’d like to know how we’re doing in meeting your expectations. Please take a moment to participate in the Karline’s Salon 2016 Annual Survey. Even on a stylist’s day off, she – that would be me – is still thinking about your hair! Welcome to my Mane-ly Monday, a time and space for collective observations and opinions on all things hair: the trends, techniques, treatments, tools, environment and more. As I reflect and recharge, this week starts where last week ended – motivated by a client’s social media posting on her Karline’s Salon experience. Behind the chair, our mission is to provide superior service with passion and urgency, while promoting continued education to you, our customer. We work hard to exceed your expectations and every day we work even harder to make Karline’s Salon your sanctuary for healthy and happy hair. Your questions are always welcome, and feedback truly appreciated. We can’t thank you enough for trusting the care of your hair to our hands. Our commitment is to deliver a salon experience that is nothing less than extraordinary.